It charges fast. It seats around 68 passengers. It’s Proterra’s electric bus. Plus video. The slowest, and arguably the most sensible, electric vehicle got a huge endorsement today. Proterra, which makes electric municipal buses and a complementary fast-charging system, raised $30 million from GM Ventures, Kleiner Perkins and others. The company's EcoRide BE35 buses began to ply the streets of Pomona, California for Foothill Transit last year and will soon be rolling out in San Antonio and Tallahassee. Sources close to the company have also said it has been in contact with municipalities overseas. Why electrify buses? Predictability. Buses are the mules of the road, driving fixed routes at moderate speeds. The Foothill Transit route that the EcoRides travels is eight miles long and the buses generally lumber along at an average speed of around 12 miles an hour. As a result, Foothill only needs two chargers, which hang on poles similar to telephone poles, to make sure the buses can complete their routes. The bus drives under the charger. They make contact and after a few minutes the bus drives on. Limited range means limited range anxiety. The minimal number of charging points will in turn give Proterra the economic wiggle room to come to market with rapid, high-speed charging. Most electric car companies and car-charging outfits will start with standard chargers, which can take hours to fully charge a vehicle. A Proterra bus can be completely charged in ten minutes or less. "It is a well-matched situation," CEO Jeff Granato told us last year. "We know exactly how far it is going. You can predict how much range a vehicle will need." The relatively short distances the bus drives, combined with the high-speed charging capabilities, also let the company minimize the size of the battery pack. Proterra's buses have battery packs in the 72-kilowatt-hour to 54-kilowatt-hour range. The Tesla Roadster has a 53 kilowatt-hour pack. So this concept revolves around a small battery and little infrastructure. Are there problems to be solved? Yes. The three buses and two chargers Foothill bought cost $5.6 million. Prices, ideally, will come down with volume manufacturing. Municipalities and the occasional large fleet owners constitute the buying public. Regulations will help too. 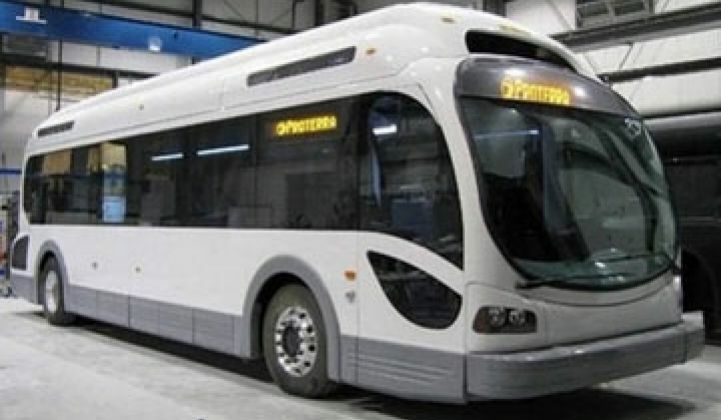 By 2012, 15 percent of the buses purchased by municipal agencies in California will have to be zero-emissions vehicles. Some of the large mega-cities of Asia have passed diesel regulations, as well. Proterra's bus gets the energy equivalent of 24 gallons an hour, it claims. A diesel city bus gets 4 miles per gallon or less. We took a test drive in San Jose back in 2009 with a Proterra prototype. It was smooth, quiet, and had a lot of room for ads from the University of Phoenix. In short, just like a regular bus but no fumes or noise.